HERE at last is the definitive Lovecraft—the first in a three-volume set of the collected macabre fiction that embodies the author’s own final thoughts and stylistic preferences. Based upon S.T. Joshi’s extensive and painstaking collation of extant manuscript materials, this new Lovecraft edition from Arkham House is the only completely authoritative text and supersedes all previous editions. 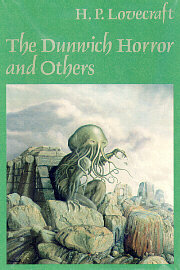 The Dunwich Horror and Others. By H.P. Lovecraft, Selected by August Derleth, With Texts Edited by S.T. Joshi, and an Introduction by Robert Bloch. Sauk City, WI: Arkham House Publishers, Inc.; 1984; ISBN 0-87054-037-8; Hardcover.